Home :: Antennas :: Outdoor Standalone Antennas :: Panel antennas :: ARC Wireless 2.4 to 2.5GHz at 19dBi Standalone Panel Antenna with N-female jack and mounting bracket kit (BRA-A-1699-02). ARC Wireless 2.4 to 2.5GHz at 19dBi Standalone Panel Antenna with N-female jack and mounting bracket kit (BRA-A-1699-02). ARC Wireless 2.4 to 2.5GH at 19dBi. Standalone Panel Antenna with N-female jack. Bracket allows either vertical or horizontal pole mounting. 18 degree beamwidth. DC Ground for lightning protection. ARC Wireless 4.9/5.8GHz 19/23dBi Standalone Panel Antenna with N-female jack and mounting bracket kit (BRA-A-1699-02). ARC Wireless 902-928MHz at 12.5dBi Standalone Panel Antenna with N-female jack and mounting bracket kit (BRA-A-1699-02). 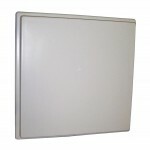 ARC Wireless 902-928MHz at 10dBi Standalone Panel Antenna with N-female jack and mounting bracket kit (BRA-A-1699-02).